gallery photo posted by Bryanconroy19 Welcome to kingsnake.com's Chameleon Classifieds. This section is for posting wanted and for sale advertisements for any and all species, color phases and morphs of Chameleons. If you are looking for, or want to post ads for, other reptiles and amphibians and supplies please review our classified index for the appropriate category. Chameleons are a specialized group of lizards distinguished by their zygodactylous feet, separately mobile and stereoscopic eyes, long, highly modified, and rapidly extrudable tongues. Approximately 160 species of chameleon range from Africa, Madagascar, Spain and Portugal, across south Asia, to Sri Lanka. 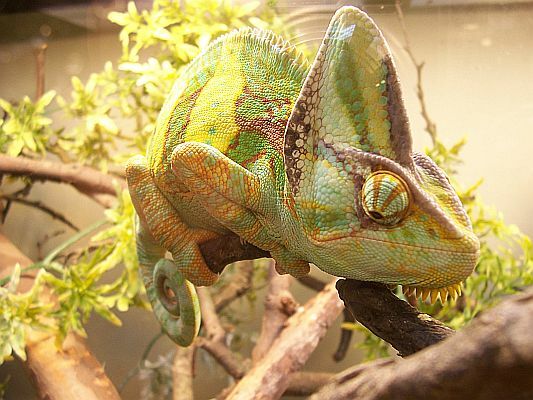 Chameleons generally eat crickets, and other insects, though a few species will consume small amounts of plant matter. For questions on keeping Chameleons please check out the Forum, or to look at photos, check out the Photo Gallery. 04/24/19 Primo Babies! BRUCE GALBRAITH CALIFORNIA / SHIPPING NATIONWIDE. 04/24/19 Rare 5th Generation NOSY FALYs High White/ Red X WC Nosy Faly BRUCE GALBRAITH CALIFORNIA / SHIPPING NATIONWIDE. 04/24/19 Rainbow Man .. Our New Gorgeous WC Stud,beautiful babies !!! BRUCE GALBRAITH CALIFORNIA / SHIPPING NATIONWIDE. 04/24/19 DIABLO ROJO Crimson Red and Intense Blue Bars !! BRUCE GALBRAITH CALIFORNIA / SHIPPING NATIONWIDE. 04/24/19 Stunning YBBB Ambilobe Panthers.. New WC bloodlines !!!!! BRUCE GALBRAITH CALIFORNIA / SHIPPING NATIONWIDE.